The Royal Ontario Museum (ROM) in Toronto is the largest museum in Canada.It is a beautiful building consisting of a heritage structure in Neo-Romanesque style and a modern crystalline shape addition designed by the architect Daniel Libeskind. Whenever we work inside the Crystal (now a nickname for the ROM), we get inspired by the art and endless artifacts around us. The interior is very spacious, and couples can request exclusive access to some levels of the museum for a walking bridal photography session. It's an excellent venue for weddings of all sizes ranging from 50 to 500 seated guests! This photo happened at the end of an Italian wedding reception right before the sweet table, covered in delicious desserts, opened for the guests. 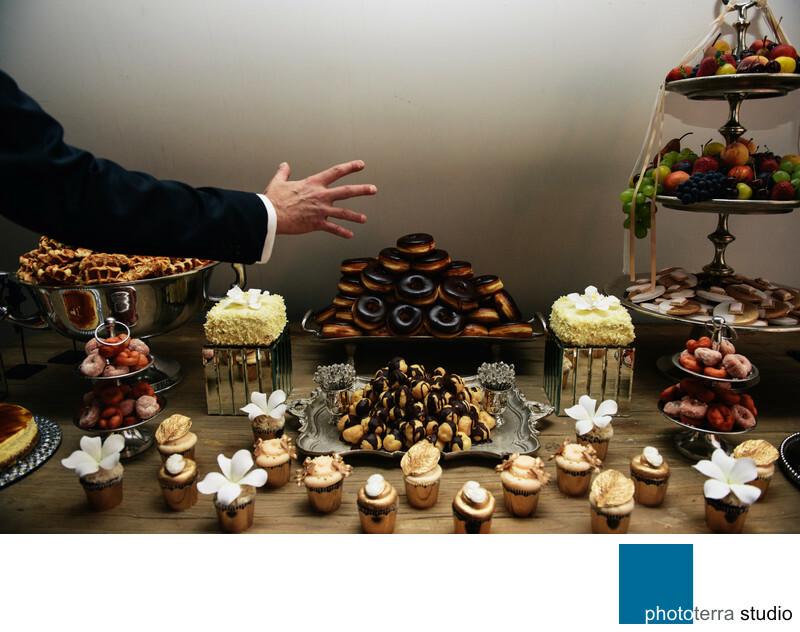 As our photographer Daria Marchenko was taking pictures of special treats on the spread, a curious gentleman was passing by and reluctantly and almost automatically reached out for the chocolate doughnuts. Similarly, Daria spontaneously took the shot. No one posed for it; no one even knew it happened. And that’s how wedding photojournalism comes about. A full team of photographers for this event consisted of Daria Marchenko, Michael Greenberg and Natalia Shaidenko. So naturally, we submit this image to WPPI (Wedding & Portrait Photographers International) competition hoping to win an award in the humor category but get an Honors of Excellence instead. This beautiful Italian extravaganza was released by Wedluxe - Canada’s luxury wedding magazine online and in print. Walsh, Ashley. “Christina & Chris.” Wedluxe. Summer/Fall 2014: 114 -119. Print. Location: Royal Ontario Museum 100 Queens Park, Toronto, ON M5S 2C6, Canada.